Grave location: lawn portion of the Tamworth Regional Council Cemetery, Showground Rd. Tamworth. memorial plaque at the front of Tamworth Police Station. Father of six, shot and killed at Tamworth, NSW, Australia, today Friday 2 March 2012. May you forever Rest In Peace with the rest of our Brothers and Sisters who have paid the ultimate price in Policing. David and Fiona Rixon have six children. 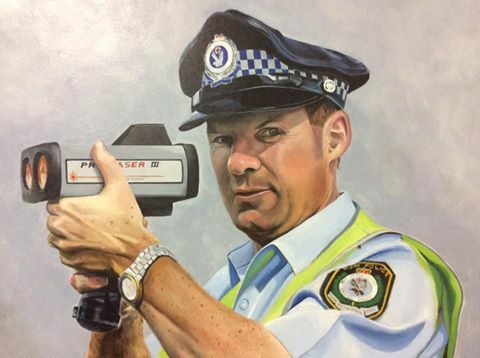 Shortly before 0800hr on Friday, 2 March 2012, Senior Constable Rixon from Tamworth Highway Patrol stopped and spoke to the driver of a vehicle at 10-12 Lorraine Street, West Tamworth for the purposes of a random breath test. As Senior Constable Rixon approached the vehicle, the offender drew a firearm and shot him. Senior Constable Rixon was able to return fire from his service pistol, which hit the offender. Senior Constable Rixon was able to place a handcuff on the offender, before he collapsed from his injuries and died at the scene. He was unable to be revived. Senior Constable Rixon joined the New South Wales Police Service as a Trainee on 28 October 1990 and was attested as a probationary Constable at the New South Wales Police Academy, Goulburn on 26 April 1991. He was initially posted to Hamilton Patrol in Newcastle and soon after was posted to Belmont Patrol. He was confirmed as Constable on 26 April 1992. 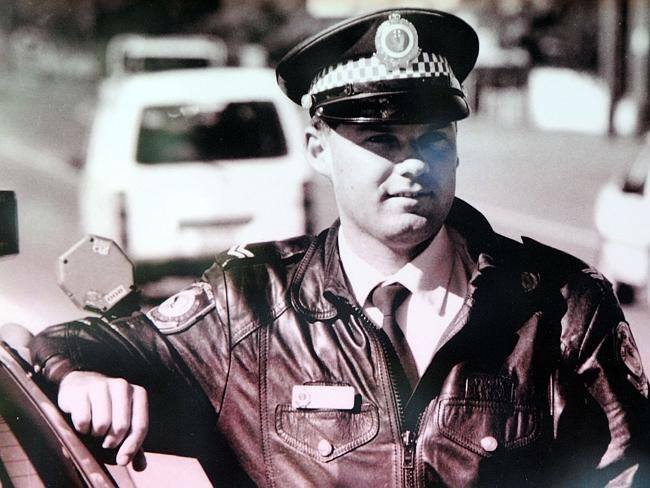 He commenced duties in Highway Patrol at Waratah in the Hunter area on 12 February 1995, and shortly afterwards, on 7 May 1995, he transferred to Gunnedah Highway Patrol. 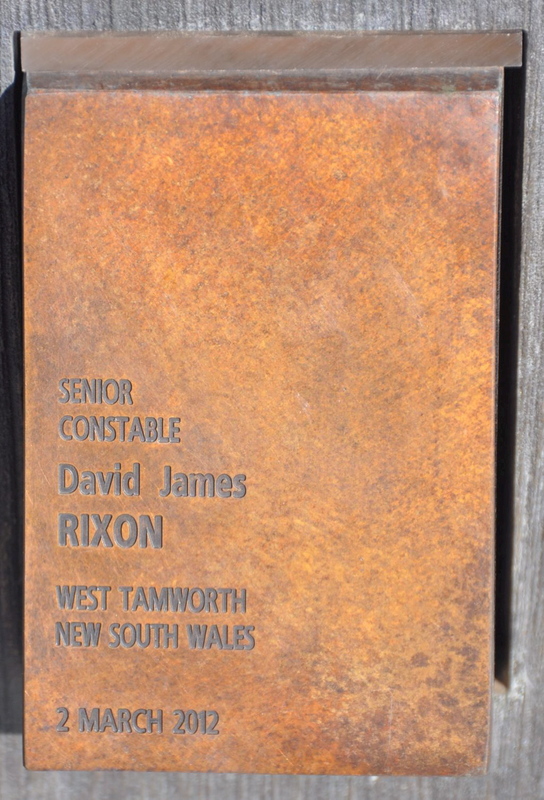 On 14 July 1996, Senior Constable Rixon transferred to Tamworth Highway Patrol, where he remained posted until the time of his death. He was posthumously awarded the Commissioner‘s Valour Award. Loving father of Renae, Jemma, Scott, Mathew, Hayley and Patrick. Loved son, stepson and son-in-law of Gwen & Max Russell, Ken Rixon, Kathryn & Robert Brooking, loved step brother and brother-in-law of Katie and Beau, Tammy, Leanne (dec), Rachelle, Nadina and Damien. 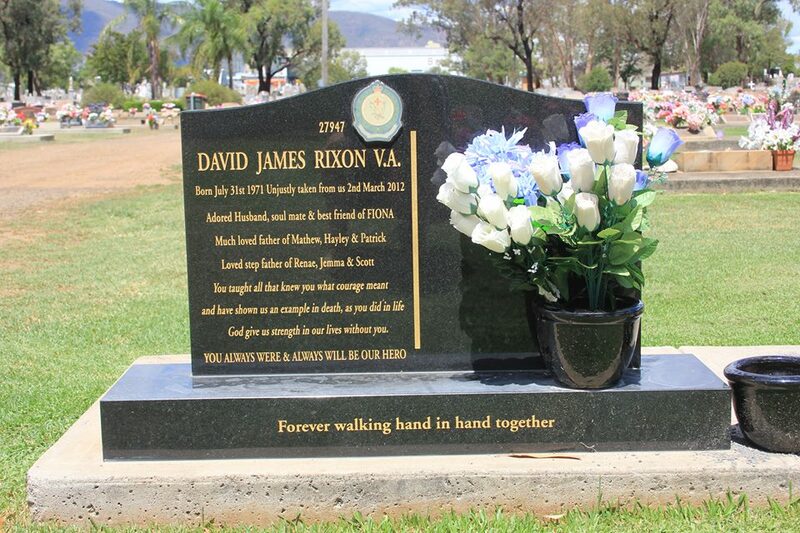 The relatives and friends of David Rixon were respectfully invited to attend his funeral. The Service was appointed to commence at 10.30 am, Thursday, 8th March, 2012, at St Paul`s Anglican Church, Church St. Tamworth, thence for interment in the lawn portion of the Tamworth Regional Council Cemetery, Showground Rd. Tamworth. * * * * *See flyer for a huge fund-raising evening that we are holding at City Diggers Club, Wollongong, on the 2 June. As you can see the entertainment line up is unbelievable.Please feel free to share this flyer with your friends. 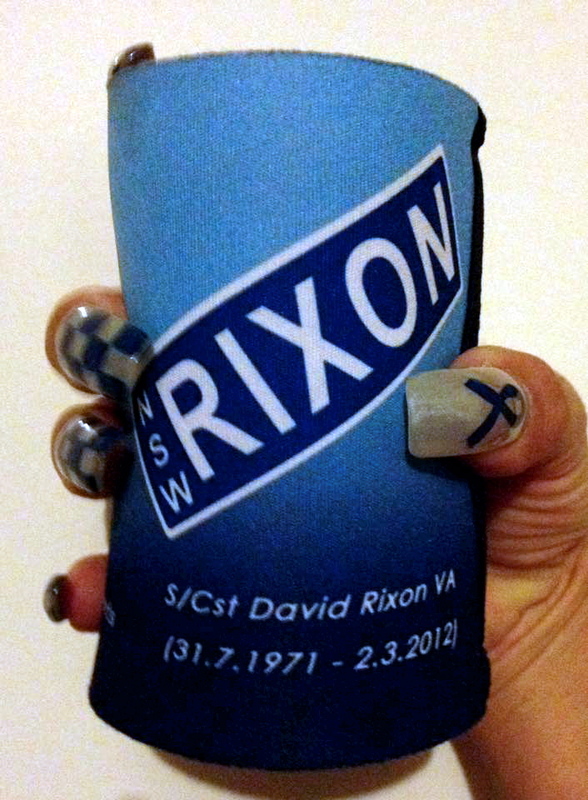 $5,000 from the evening will be donated to the Senior Constable David Rixon Memorial Fund. David left behind a wife and 6 children when he was tragically killed recently. His friends from within the New South Wales Police have set a target of $1,000,000. This is our way of showing support. Please do not put off getting your tickets as we are capping the evening at 250. 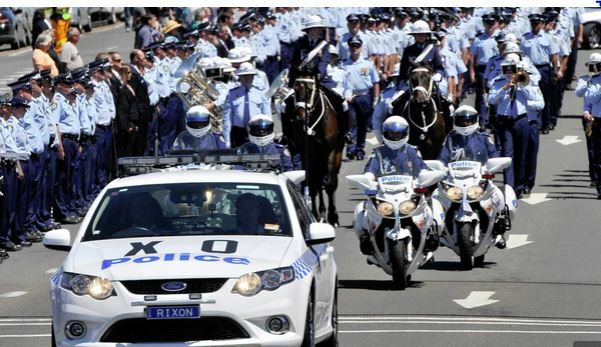 It was meant to be a regular day for Tamworth police officer and father-of-six David Rixon. The NSW highway patrol officer was carrying out a routine breath check in 2012 when the driver, Michael Jacobs, pulled out a revolver and shot him in the chest. He returned fire, hitting Jacobs in the abdomen, leg and shoulder, called for back-up and handcuffed Jacobs before collapsing. His killer went on to receive life-saving surgery and a life sentence. But Senior Constable Rixon died at the scene, leaving behind a heartbroken wife and six children. Three years later, he has been honoured for his bravery. Sen Const Rixon is one of 25 people to receive an Australian Bravery Decoration on Wednesday from Governor-General Peter Cosgrove. Mr Cosgrove says Sen Const Rixon and the other recipients are a source of courage, support and inspiration, but he acknowledged there can be devastating consequences resulting from their bravery. “Sadly, there are those whose brave acts mean they are no longer with us,” he said. The Australian Bravery Decorations recognise acts of bravery by members of the community who selflessly put themselves in jeopardy to protect the lives or property of others. The recipients are nominated by members of the public, with the governor-general deciding the awards. They vary from Mustafa Ruhi Akkan and Nattapat Penpanussak, who helped police apprehend a man who stabbed three backpackers in 2000, to Jamie Alan Strong, for helping rescue two people trapped in a burning house in 2014. 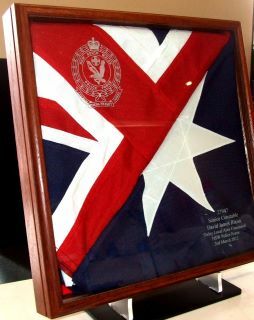 One of the highest honours, the Star of Courage, is awarded to a 21-year-old RAAF pilot named James Wallace Hocking. In 1944, he saved his crew and the English township of March by flying his stricken bomber away from civilian danger. He died when the plane crashed into a nearby field. There are four levels of decoration and a Group Bravery Citation, an award for a group of people involved in a single incident. They are the Cross of Valour, the Star of Courage, the Bravery Medal, Commendation for Brave Effort and the Group Bravery Citation. National Bravery Awards: Tamworth Police Officer David Rixon honoured after on-duty death. A SOMBRE anniversary falls today as police officers and community members join the family in remembering fallen Tamworth police officer Senior Constable David Rixon a year after his death. 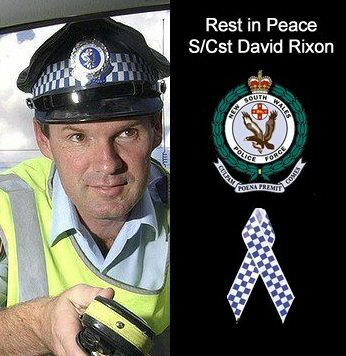 On March 2, 2012, Senior Constable Rixon was fatally shot on a routine traffic stop in West Tamworth. Senior Constable Rixon’s wife Fiona and their children will be joined by officers from across the state to mark the anniversary, many of whom have spent the past week completing a charity walk in his honour. Officers will form a sombre march to Tamworth Police Station to arrive at 8am, where the flag will be lowered to stand at half mast. 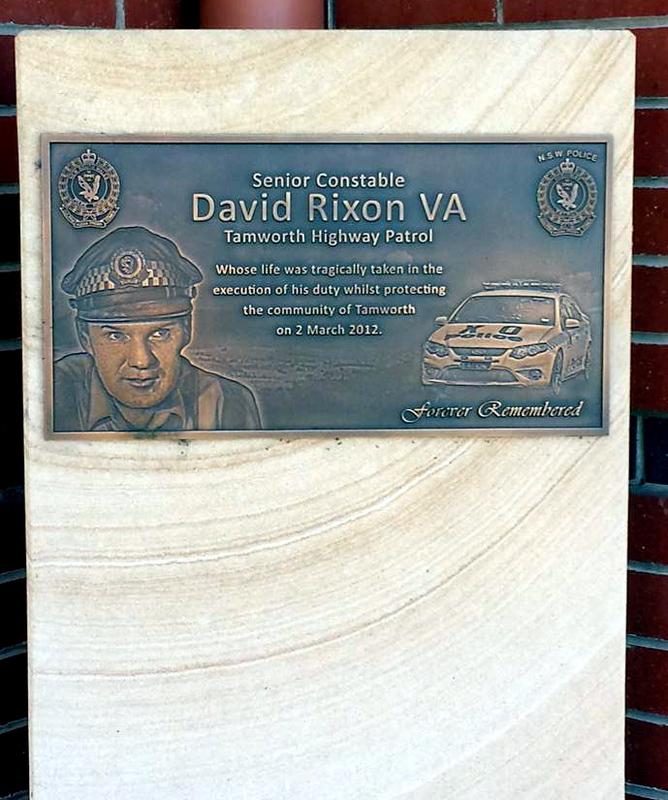 NSW Police Commissioner, Andrew Scipione, will unveil a plaque honouring Senior Constable Rixon, during a ceremony at Tamworth Community Centre at 11am. Fiona Rixon said she will take a private moment during the day to remember her husband, the man who she described as her “other half”. “He was my best friend, we did absolutely everything together, everything,” she said. About 60 police officers of the 140 who walked arrived in Tamworth last night after a 370km journey titled “Our Mates, Our Families,” which began in Wyong last Monday. Rainy weather welcomed the walkers as they completed the last few kilometres of their 10-day trek, ending at the Longyard Hotel. 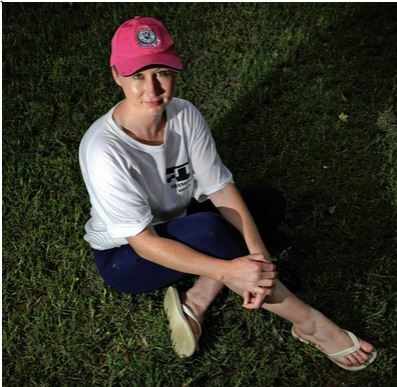 Senior Constable Rixon’s stepdaughter and Probationary Constable Jemma Galea, who walked alongside four officers from the Oxley Local Area Command, said today’s memorial services would be bittersweet for her and her family. “I guess it’s hard to say how it will affect you until the day,” Probationary Constable Galea said. Completing the last of the walk alongside her mother yesterday, she was wearing the bright pink cap she wore for the the duration of the walk. The cap was the subject of a personal joke between her and her stepfather. “David said to me when I bought it, ‘When are you ever going to wear that hat?’” Probationary Constable Galea said. Ms Galea said the walk was harder than expected, and she was full of “sore muscles, blisters and a bit of sunburn”, and everyone was looking forward to a hot shower before the fundraising event at Wests’ Diggers last night. The walkers camped along the way, passing through six police local area commands, many of whom sent officers to Tamworth to help out in the days and weeks after the tragedy. Organising police from Tuggerah Lakes said they were inspired by the Cooee recruitment march, a famous walk that began in Gilgandra in 1915 with 35 men, its ranks swelling to 265 by its end in Sydney, all eager to join the Australian war effort for WWI. Oxley Local Area Commander Superintendent Clint Pheeney said his officers were honoured to take part in the walk, and ceremony, to remember their former colleague. “David’s death was heartbreaking for all of us at Oxley Local Area Command,” Superintendent Pheeney said. “I’m extremely proud of all the officers who have taken part in the gruelling walk as it shows their resolve and determination to honour their mate, and to raise funds for not only his family, but the families of other fallen officers. “I’m particularly proud of all of David’s colleagues here at Tamworth who have continued to do their job on a daily basis since his death, even though all their hearts have been broken. Commissioner Scipione said the relay-style walk from Wyong Police Station to Tamworth was raising money for both the NSW Police Legacy and the David Rixon Memorial Fund. “Last year we experienced the tragedy of losing two of our officers and so we all have extremely heavy hearts today,” Commissioner Scipione said. “However the ceremony gives us the opportunity to reflect on Senior Constable Rixon’s life and career, and to remember the outstanding husband, father, friend and colleague that he was. The official ceremony will take place at 11am at Tamworth Community Centre in Darling St. THE man who shot Senior Constable David Rixon has become the first person jailed for the term of his natural life for murdering a police officer. Michael Allan Jacobs has this afternoon been sentenced to life with no parole for murdering Sen-Constable Rixon, the crime described by Justice Richard Button as “a life irrevocably taken”. Jacobs is the first person to be convicted of murdering a police officer since the O’Farrell government introduced legislation in 2011 to ensure such an offence is punished by a sentence of life with no parole. “The offender informed the intention to kill him,” Justice Button said. Court artist sketch of Michael Allen Jocobs. 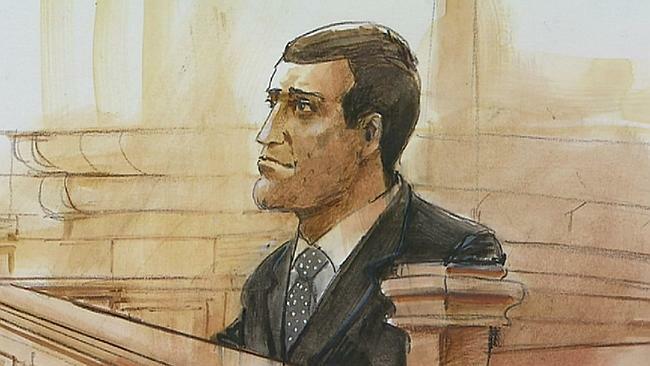 Police Commissioner Andrew Scipione and NSW Police Minister Mike Gallacher joined more than 20 police officers in court for the landmark sentence. Sen-Constable Rixon was shot once in the chest with a bullet fired from a .38 calibre revolver after approaching Jacobs’ stopped Holden Statesman for a random breath test early on March 2 last year. The policeman returned fire and hit Jacobs three times, leaving the man with “an out of control drug addiction” critically wounded, before he collapsed from his injuries. “The offender almost died from his injuries,” Justice Button said, adding that in his dying moments Sen-Constable Rixon had handcuffed Jacobs to arrest him. 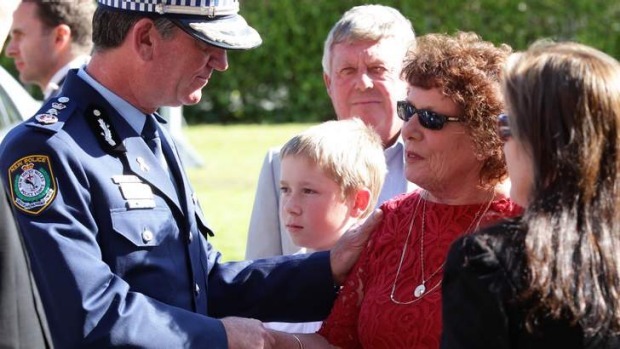 Police arrived shortly after the shooting but Sen-Constable Rixon couldn’t be revived, while Jacobs received lifesaving surgery and eventually recovered after spending more than a month in hospital. The Crown claimed he was high on ice at the time, making him more prone to aggression, and shot the policeman to avoid being locked up and convicted for repeatedly driving unlicensed. The sun had only recently risen over the roof of Tamworth police station when the white, dark-windowed bus arrived. One by one about 30 officers filed on and settled in for a six-hour journey that they hoped would end with justice for a fallen comrade and perhaps a small measure of closure for those left behind. 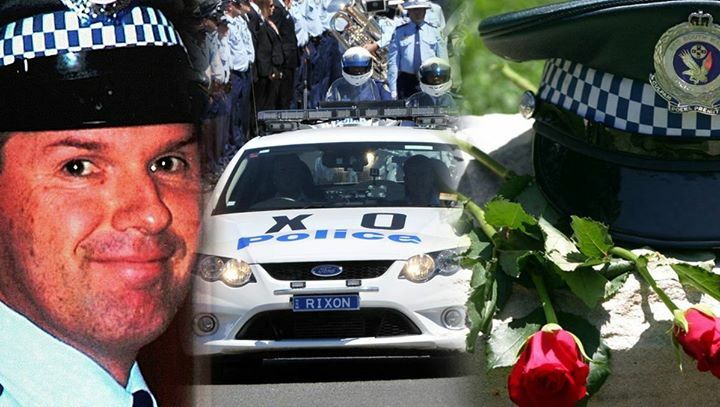 Eight hours and 400 kilometres later, a NSW Supreme Court Justice gave the family, friends and colleagues of murdered police officer Senior Constable David Rixon the result they desired – a life sentence for the man responsible for his death. In a landmark decision, Michael Alan Jacobs, 49, became the first person sentenced to life in prison under new laws requiring a mandatory life sentence for anyone who murders an on-duty police officer in NSW. ”Let this serve as an example to all those in the future who think it’s OK to harm our police officers,” NSW Police Minister Mike Gallacher said after the sentence was handed down. 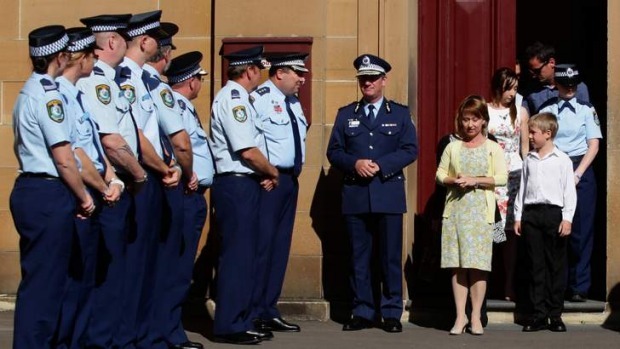 Nearly a quarter of the Oxley Local Area Command were present to hear the sentence, forming a guard of honour as Senior Constable Rixon’s widow, Fiona Rixon, and their children left the court. ”I’m very proud of my children – we’ve been through this hurricane, tornado, roller-coaster ride, whatever you want to call it, for the last 18 months,” an emotional Mrs Rixon said. On March 2 last year, Jacobs shot and killed Senior Constable Rixon, a 40-year-old father of six, during what was to have been a regulation breath test on Lorraine Street, West Tamworth. During a month-long trial earlier this year, the court was told that the experienced highway patrolman had recognised Jacobs as a disqualified driver and followed him from nearby Gunnedah Road to the quiet side street. Jacobs then fired a single shot from a .38 calibre pistol that went straight through Constable Rixon’s left wrist and into his chest, puncturing his heart and lung. The officer returned fire, hitting Jacobs in the leg, abdomen and shoulder. He collapsed soon after. Jacobs is heard to say ”die … I’m sorry sir, sorry, sorry”. The officer’s last act was to handcuff his killer. Jacobs later claimed that it was not he but a local drug dealer, Terrence James Price, who fired the fatal shot after the policeman ”interrupted” them in the middle of a drug deal, but this was rejected by the jury. In sentencing Jacobs to life in prison, Justice Richard Button said the 49-year-old had no apparent motive for committing the crime and had shown little or no remorse. ”It is almost impossible to believe that, in order to avoid a short period of being denied bail or, at worst, a sentence of a matter of months for driving whilst disqualified, the offender saw fit to fire a handgun at a police officer,” he said. As well as providing some relief to Senior Constable Rixon’s family and fellow officers, the life sentence represents a landmark decision for the state’s mandatory life sentencing laws. Jacobs’ case was seen by many as a test of the laws, introduced in 2011, which require judges to impose a life sentence on any offender found guilty of murdering an on-duty police officer. Crucially, Justice Button found that Jacobs’ crime met all the criteria set out in the mandatory life sentence legislation, including that he had acted with the intention to kill the officer. ”That intention may have been held only fleetingly and utterly irrationally, but nevertheless I consider that it has been established to the criminal standard,” he said.